According to the mostly recently released data, the disconnect in the silver market continues. According to the mostly recently released data, the disconnect in the silver market continues. Now, when I say a disconnect, I am referring to the interesting change in supply demand trends in the silver market. Currently, we are witnessing an abrupt change in normal silver market dynamics. For example, industrial silver demand has been the leading indicator for the silver market by a majority of official sources. 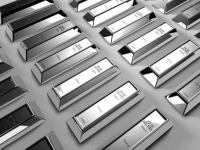 There have been many reports published by banks and institutions on the growth and outlook of the silver market based on future industrial demand. Basically, the health of the silver market was forecasted by the amount of growth in the industrial sector. However, something changed over the past several years to muck-up all this hard work and analysis by our wonderful counterparts in the financial industry. For one thing, I don’t think any bank or brokerage analysts could foresee that physical silver investment demand would skyrocket 282% from 2007 to 2014. The jump in physical silver investment demand makes the growth of industrial silver demand… quite embarrassing. That being said, new data released by the U.S. Geological Survey (USGS) confirms my forecast that the situation in the silver market continues to detach itself from normal supply demand dynamics. Thus, normal trends in the silver market are being disrupted by this present surge of physical silver investment demand. The USGS reported that the U.S. imported another 474 metric tons (mt) of silver in July, up from 457 mt in June for a total of 3,440 mt for the year (109 million oz-Moz). As we can see from the chart, this is 600 mt more (21%) than the same time last year. The U.S. imported a total of 4,960 mt (159 Moz) in 2014, but if the current trend continues, silver imports may reach a total of 6,000 mt (193 Moz) this year. According to the import data, other U.S. silver imports (associated with industrial fabrication) were down between 5-61% for the first seven months of the 2015 compared to last year. So, why would the United States need an extra 600 mt of silver bullion and Dore’ bars (Dore’ bars are silver bars poured at the mines needing further refinement) if industrial fabrication was lower? If not industrial demand, maybe increased silver jewelry demand is the culprit. I have seen estimates that lower silver prices have sparked increased silver jewelry demand in the U.S. of approximately 10% in the first half of 2015. But, this isn’t really all that much when total silver jewelry fabrication in the U.S. was only 397 mt in 2014 (GFMS World Silver Survey 2015). Thus, a 10% increase of half of that amount (199 mt) would only be a growth of 20 mt. The U.S. imported an extra 600 mt from JAN-JUL compared to last year, so a lousy 20 mt increase in jewelry demand doesn’t account for the recent surge in U.S. silver imports. As I have stated several times, I believe the increase of U.S. silver imports is tied directly to the jump in physical silver investment demand. 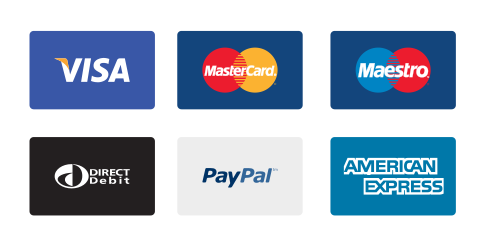 Not only are many small investors adding to their stash of silver bullion, I believe several large entities are also acquiring a great deal of the shiny metal. This past weekend I spoke with Doc and Eric at Silver Doctors. If you haven’t yet listened to the SRSrocco & Silver Doctors Interview, you might want to check it out as we covered some interesting information and data. One of the items I mentioned during the interview was that the huge increase in Indian silver imports were starting to put stress on the overall market. This stress made its way over to the U.S. Silver Market as the U.S. started exporting silver bullion to India… something it hasn’t done for many years. The United States exported virtually no silver to India over the past two years, but this jumped to 39 mt in May and 75 mt in June. I stated in the interview, even though the USGS data for July, August and September were not yet out, I believed we would see possibly even higher U.S. silver exports to India in the following months. What’s even more interesting than the exponential increase of U.S. silver imports to India over the past several months, is the percentage of total exports. 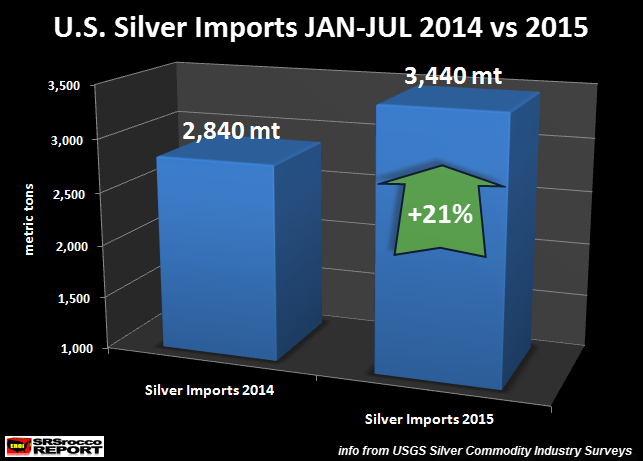 The U.S. imported 227 mt of silver bullion to India JAN-JUL which accounted for 45% of the total 523 mt. Get this. 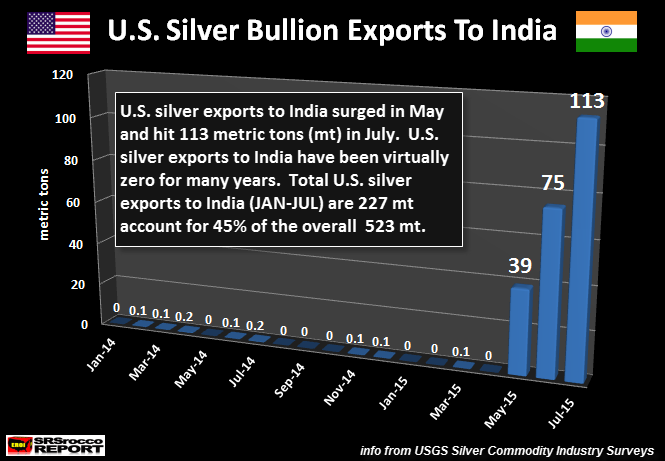 The U.S. only imported about 1.5 mt of silver bullion to India in 2014 of the total 382 mt exported during 2014. Again, this shows more evidence how much the silver market has disconnected from its normal supply demand dynamics. As we can see, the other segments in the silver market have grown or fallen marginally over the past seven years compared to Silver Bar & Coin demand. Furthermore, the current surge of physical silver investment demand, whether it be from India (silver bar) or North American (Official coin), continues to put stress on the silver market. This stress is forcing a disconnect in normal supply-demand forces that will likely get worse if the world experiences more financial turmoil or stock market panics in the future. If you haven’t checked out THE SILVER CHART REPORT, there’s a great deal of information on the Silver Industry & Market not found in any single publication on the internet. There is one chart in this report (Chart #19) that I can guarantee that 99.9% of precious metal investors haven’t seen before.